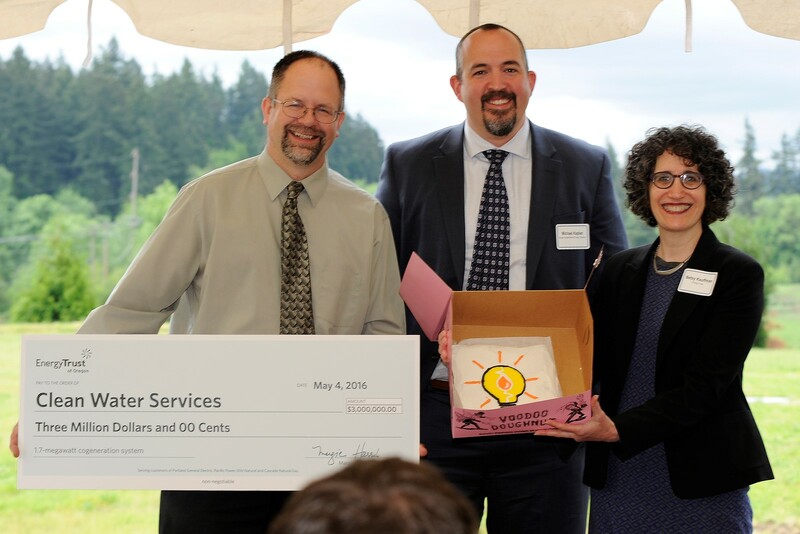 On May 4, Clean Water Services, Oregon Department of Energy and Energy Trust of Oregon celebrated a new cogeneration system that converts wastewater and food grease into clean, renewable energy. The new system, located at the Durham Treatment Facility in Tigard, triples Clean Water Services’ renewable energy generation, creating 60 percent of the electricity needed to run the water resource recovery facility when coupled with its existing 403-kilowatt solar electric system. The systems are expected to generate 12,800 megawatt hours of electricity per year—enough energy to avoid producing 6,000 tons of carbon dioxide. “Clean Water Services is turning a liability into an asset by harnessing energy that was literally going down the drain and using it to generate clean power. That’s smart leadership and a cost-effective investment,” said Betsy Kauffman, renewable energy sector lead, Energy Trust. Since 1993, Durham has operated a 500-kilowatt cogeneration system using biogas from treatment of the communities’ wastewater to help offset its own energy usage. By replacing this smaller engine with two new engines, Durham now has a 1.7-megawatt cogeneration system fueled by biogas produced from the anaerobic digestion of municipal wastewater solids as well as fats, oils and grease (FOG) from Washington County restaurants. FOG, also known as “brown grease,” is pumped out of restaurant grease traps and interceptors at regular intervals. More than 60 people attended this “waste to watts” event, including Washington County board members, state representatives and members of Senator Jeff Merkley’s staff. Voodoo Doughnuts was on hand to provide refreshments, giving a nod to the FOG that is helping to create clean, renewable energy. The agency received $3 million in cash incentives from Energy Trust and $2.8 million in tax credits from the Oregon Department of Energy to help offset the cost of this $16.8 million project. Michael Kaplan, director of the Oregon Department of Energy noted that the opening of this facility supports the state in making its transition to clean energy.